"So when you offer your gift to God, think about other people. If you are offering your gift before the altar, and you remember that your brother has something against you, then leave your gift there at the altar. Go and make peace with that person. Then come and offer your gift." When we come face to face in worship, we are forced to recognize that we stand before God as righteous and acceptable to him only because of his forgiveness, mercy, and grace. How dare we try to worship him and receive this forgiveness, mercy, and grace when we are not in a good place with others in our Kingdom family! There is an incredible consistency throughout Scripture about God's wanting us to be right with each other if we are going to be right with him. The Ten Commandments have four commands that focus on the Lord and six that focus on our relationships with each other. The prophets emphasized that God hates the worship of those who mistreat or exploit others. Jesus emphasized that we could not be forgiven if we are unforgiving. He even says that we will be judged by the same standard by which we judge others. 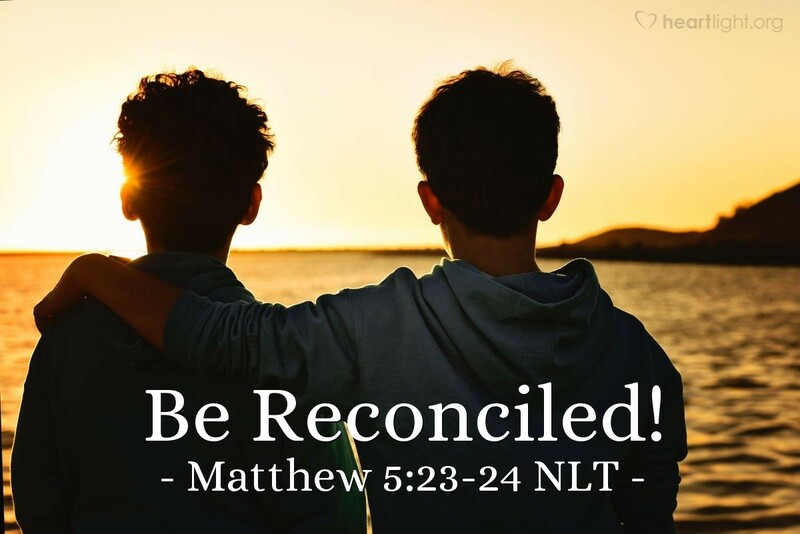 No matter how moving, how inspiring, how "spiritual" our worship may seem, if we harbor evil against each other or have harmed another in our Kingdom family and not tried to reconcile, God will not accept our worship. Merciful Father, forgive me for harboring grudges, saying unkind things, and being insensitive to the hurts I have caused to your children. I relinquish any grievance and give up any claim against my brothers and sisters in Christ and pledge to live with them in your Kingdom in a way that reflects your mercy and grace. In Jesus' name I pray. Amen.